Intrecci Urbani, the big yarnbombing event in Genoa that I visited over the weekend, was so big I will have split up my photo posts into at least five posts! This is post five. You will find post one here, post two here, post three here and post four here. Readers, I can’t stress enough just how big Intrecci Urbani was. There were hundreds of individual pieces of crochet and knitted decorations, ranging from tree coverings, rectangles attached to railings, pieces covering lamp posts, coverings for benches, ornaments hanging from trees, even a spiderweb and a Rastafarian. Hours and hours, meter upon meter of yarn and millions of crochet stitches must have gone into this great project. You can read more about the idea, and people behind, the project in this blogpost. Below is a WordPress gallery of all the colourful railings and benches. If you click on any of the photos it will open up a slideshow of full size photos that you can click through. I don’t think the slideshow function will work if you are reading this post on email, so I suggest visiting the “real” post if you want to see full size photos. Intrecci Urbani, the big yarnbombing event in Genoa that I visited over the weekend, was so big I will have split up my photo posts into at least five posts! This is post four. You will find post one here, post two here and post three here. Below is a WordPress gallery of my photos of the old harbour crane. I love that the yarnbombers went so far, literally, as to get onto cranes themselves in order to attach their work to the very top. Hats off to you ladies! A close-up of one of the yarnbomb pieces I saw at Intrecci Urbani on Friday. Such a cheery image, isn’t it? Intrecci Urbani, the big yarnbombing event in Genoa that I visited over the weekend, was so big I will have split up my photo posts into at least five posts! This is post three. You will find post one here and post two here. Below is a WordPress gallery of all the yarnbombing around the Aquarium in Genoa. Intrecci Urbani, the big yarnbombing event in Genoa that I visited over the weekend, was so big I will have split up my photo posts into at least five posts! This is post two. You will find post one, here. Below is a WordPress gallery of the ocean themed yarnbombs. The last eight photos in the slideshow show my favourite piece of the whole event. There is such a lot of texture and amazing attention to detail! It looks more like a wall hanging than something for a yarnbomb that is exposed to the elements, only to be taken down in a week. I hope whoever made it will hang it somewhere safe where it can be admired. I may even go so far as to say that they have to get it framed. Intrecci Urbani, the big yarnbombing event in Genoa that I visited over the weekend, was so big I will have split up my photo posts into at least five posts! This is post one. Below is a WordPress gallery of the yarnbombed trees. If you click on any of the photos it will open up a slideshow of full size photos that you can click through. I don’t think the slideshow function will work if you are reading this post on email, so I suggest visiting the “real” post if you want to see full size photos. A beautiful stop motion advertisement filled with crochet and romance. I can watch it over and over again. On the 20th of November last year I reblogged a blogpost from Streetcolour about a whole town that is going to be yarnbombed. The town being Genoa, in Italy. This is the post. What I didn’t tell you is that my amazing, super duper fantastic husband’s response to the blogpost was “Why don’t you go to Genoa and see the yarnbomb? You know you want to.” John’s response came exactely a week before he was due to go to hospital for the kidney donation operation, so his gracious offer meant even more to me on so many levels. John suggested I take my very good friend with me for a girly weekend. I bought the tickets, booked the hotel. All that was left to do was for her to get a Schengen Visa. Unfortunately things didn’t work out as we hoped and due to a South African passport taking ages to be renewed, she won’t be able to go with me. John will now be going in her place. Obviously crochet isn’t his thing, and he doesn’t particularly like Italy, but he still agreed to come with me. Not only that, he has to fly to Milan and get a train to Genoa, whereas I will be flying direct to Genoa. At least he is returning on the same flight as me so it’s all good. By now he is also such a big part of my yarnbomb shenanigans (holding ladders, taking photos, making sketches, taking measurements) that he might as well come along and see how it’s done on a City-wide scale. His position as the World’s Best Husband is now firmly cemented. Now you probably want to know more about this amazing yarnbomb. Firstly, take a look at this video. I don’t understand Italian, and there are no sub-titles, but the imagery is enough to make you salivate and itch to be part of this thing! The website dedicated to this project, called Intrecci Urbani, is here. The idea was born in a project of national civil service with the aim of developing relations between the generations , particularly among young and old, and provides for the creation of a great yarn bombing event will culminate with the creation of a collective installation that will be exposed to about 10 days, in the Old Port of Genoa from 21 March 2013 . The project also joined associations and creative yarn bombing of some Italian cities that send their work to contribute to the event in the spring. After exposure the artifacts will be dismantled and reused for the construction of facilities in the area, while those injured will be turned into blankets to be distributed to homeless people and shelters for animals. The main installation will be at the Old Port from 21 March to 1 April 2013. My mind boggles at the logistics involved in this. Whoever organised this event is one very organised individual. 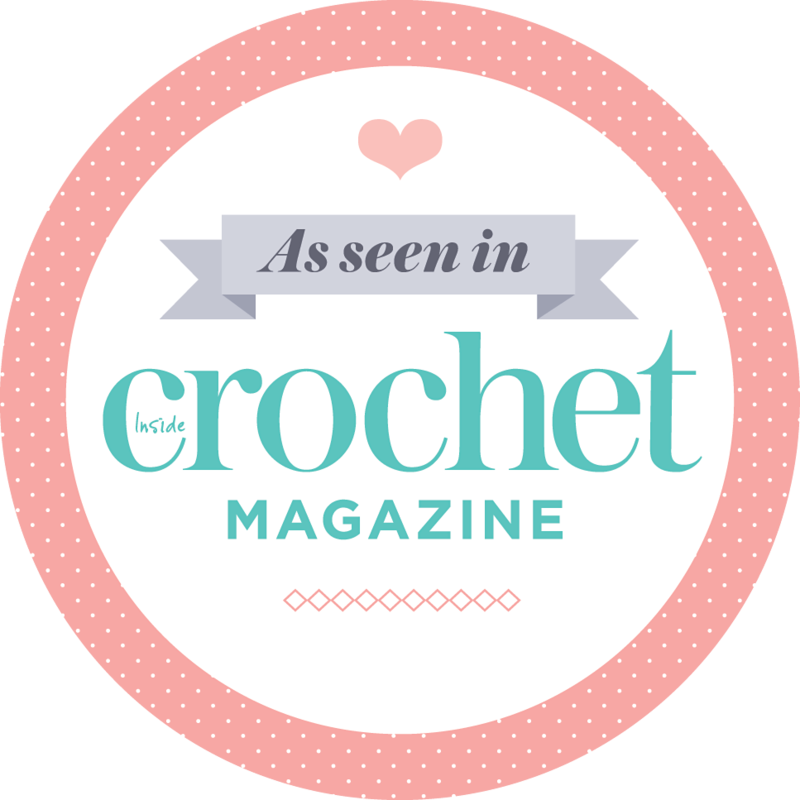 The crocheters and knitters meet every second Saturday at the M-Cafe in the Doge’s Palace – how stylish and very Italian? !, the yarn has been sponsored so it’s all the same weight and colour, and they even have a pattern book for the flowers and squares used in the yarnbomb. Uniformed creativity seems to be what they are aiming for. 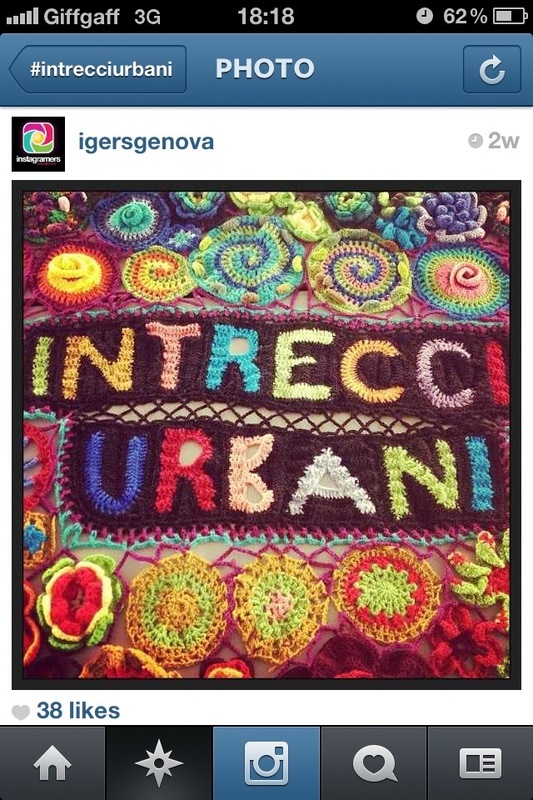 They also have an Instagram feed (#intrecciurbani) and you can follow the event on their Facebook page. In two weeks I’ll be in Genoa to see an Italian City yarnbombed, and the following weekend I’ll be yarnbombing in a town in England! How amazing is that?! I truely can’t wait. 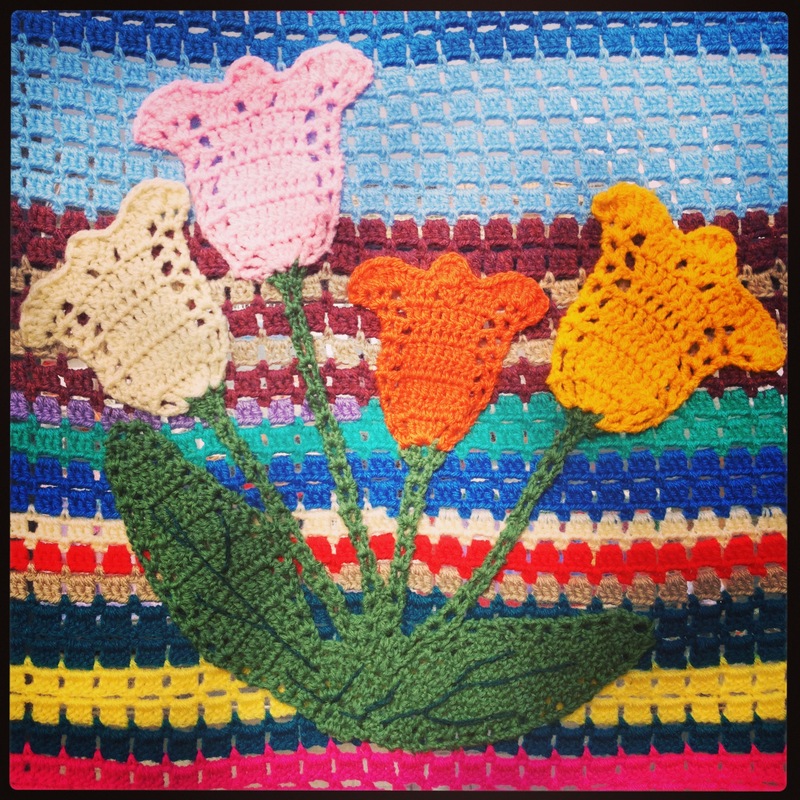 I think I will take a little something crocheted with me to Genoa to add to their yarnbomb…. I think I’ve had my fill of fruit for now: 14 Days of crocheting fruit (including on the 07:26 to Waterloo and lunch hours in Caffe Nero), four balls of Stylecraft Special Chunky and six balls of Sirdar Hayfield Bonus Chunky later, I’ve made 64 pieces of fruit for the Surbiton Food Festival yarnbomb. 64 Pieces of crochet fruit over 14 days works out to just under 5-a-day. How health conscious am I?! Crocheting the fruit was fun, but doing the stems and leaves and then having to sew the three (tiny) parts together got a bit tedious by the time I got to pear number 15, give or take an orange or two. Now, thankfully, it’s time to move on to stripes. My favourite thing in the whole world. Just mindless trebles in any colour and I can go as mad and bright as I want. In fact, for the purpose of a yarnbomb the more outrageous the colours the better! My amazing husband was with me two weeks ago when I went to Surbiton to take measurements. He is a stickler for detail and an excellent draughtsman. 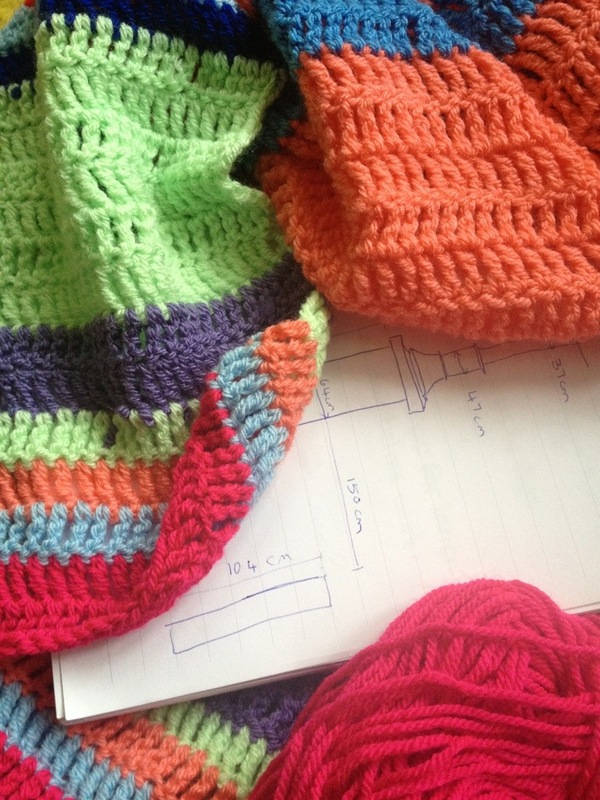 With his accurate measurements and my love of colour, the yarnbomb is going to look great! Lovely Alice of Knit n Run 4 Sanity has blogged about her very cute cherries, grapes and strawberry contributions here. She even shares her pattern with us. Thank you so much Alice!! Just to recap, the details of the fruity yarnbomb is in this post, and the pattern for the crocheted fruit is on this link: Crochet fruit pattern. 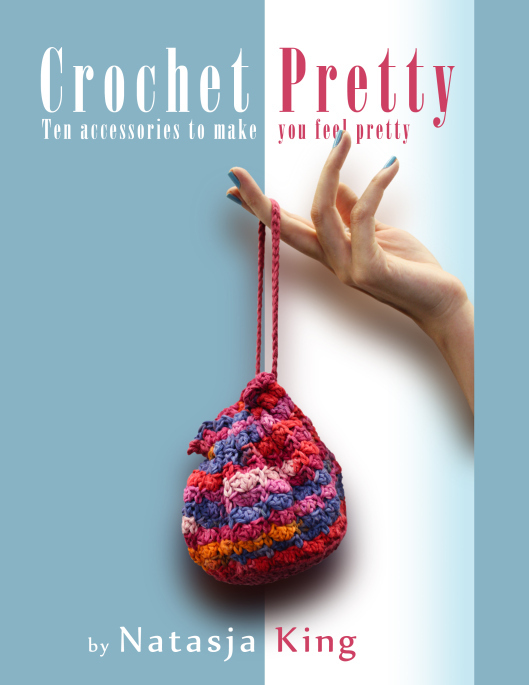 Anyone can crochet fruit and send it to me, as long as it reaches me before 22 March 2013. Apart from Alice and Louise (the designer of the fruit patterns) I have a lady from Dubai who is contributing and I think one or two from South Africa as well! 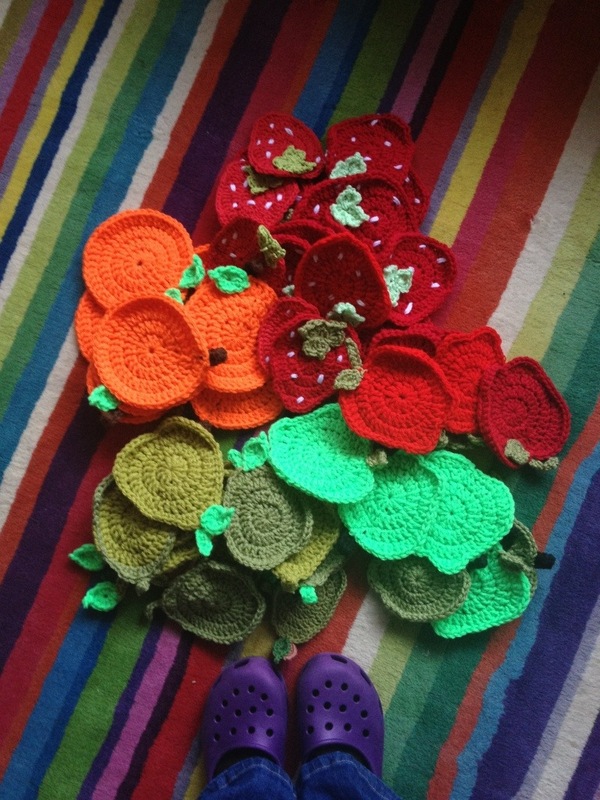 If you are also crocheting fruit for the yarnbomb, how many have you made? One of the Partners at the law firm where I work, sent me this photo via this link. 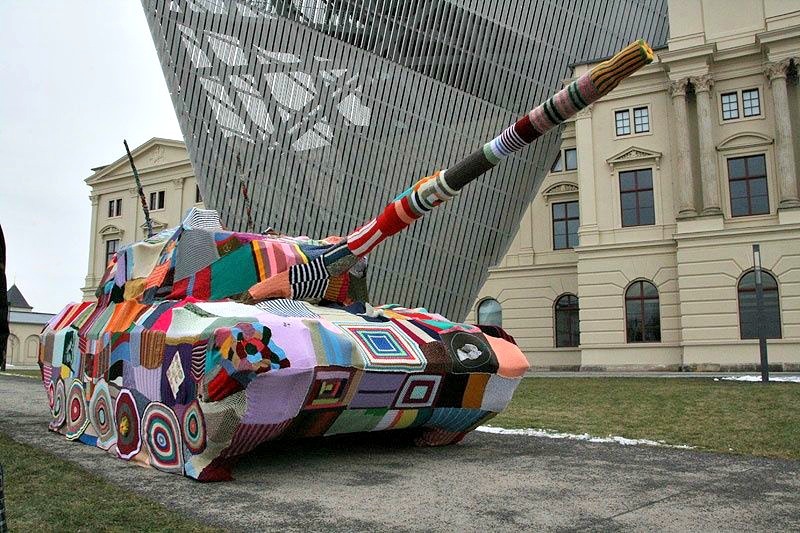 Apparently the tank was yarnbombed by the women from Dresden, Germany and they used 36kg of wool! I wonder if it shoots yarn? Would be great if it did. Every second shot could be a crochet hook and the victor would be the soldier that crochetes the most scarves for the opposing side. That’s my kind of “friendly fire”.